Now more than 3 decades into this epidemic, our clients still endure stigma and discrimination. Although progress has been close to miraculous in some ways, especially in the area in treatment, people living with HIV/AIDS are often afraid to seek the help they need for fear of ridicule, judgment, and isolation. This stigma is, as unfortunate as it is, is real. This stigma keeps the community from seeking the education and tools they desperately need to prevent the spread of HIV. Your financial support allows us to offer programs that provide life-saving, life-enhancing medical care and support services to people living with HIV/AIDS. Your support helps UCSC contribute to a culture that values education, awareness, compassion, and understanding. This is a culture that outright rejects stigma. I’d like to personally thank you in advance for the role you will play in providing a future of hope for a world without stigma, fear and ignorance about HIV/AIDS. Upper Savannah Care Services is the nonprofit 501c3 organization providing HIV/AIDS care services in Greenwood, Laurens, Edgefield, Abbeville, McCormick and Saluda counties of South Carolina. We are the only organization in our community 100% dedicated to the care and support of those affected by HIV/AIDS. Your financial support allows us to offer programs that provide life-saving, life-enhancing medical care and support services to people living with HIV/AIDS. The people of UCSC embrace a culture that values education, awareness, compassion, and understanding - a culture that outright rejects stigma. How Do You Know If You Can Use Our Help? If you are newly diagnosed or living with HIV, you may qualify for supportive services. These may include medical case management, assistance with HIV-related medical visits and labs, assistance with HIV-related medications, housing (rent/mortgage) and utilities assistance, food/nutritional assistance, transportation assistance to HIV-related appointments, substance and alcohol abuse therapy assistance, mental health evaluation and treatment assistance. Case management is a multi-step process to ensure timely access to and coordination of medical and psychosocial services for people living with HIV/AIDS and their family/close support systems. Prevent active and at-risk clients from falling out of care & reach out to former clients that have fallen out of care. OS and/or SMCM utilize the client’s current personal strengths to address and overcome barriers preventing the client from continuously engaging in care and treatment with aid of OS and/or SMCM. USCS has been providing HIV/AIDS-related services, care, and education since its inception in 1995. 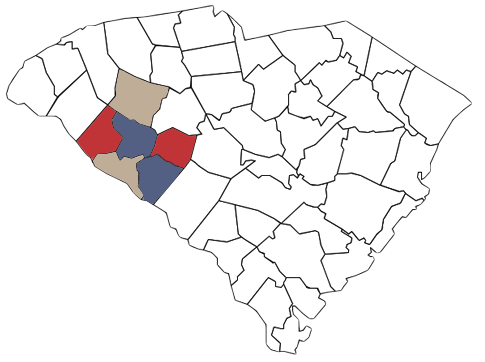 The agency was established in response to the devastating impact that HIV/AIDS in the surrounding six counties of Greenwood, SC. The VISION of Upper Savannah Care Services is to get HIV infected clients into care and then maintain their HIV care along with a healthy lifestyle which will reduce new HIV infections and improve the quality of life of its clients and the community by keeping clients HIV non-detectable. Our goal along with the Centers for Disease Control is no new transmissions by the year 2020. To learn more about HIV visit www.cdc.gov/std and www.scdhec.gov/health.